These conchae ( or turbinates ) are basically thin, scroll - like bony projections covered by mucous membrane. They narrow the nasal passages and create a large surface area, forcing inhaled air to pass around and over them. This arrangement aids in warming and moistening of the inhaled air. - Superior meatus - below and lateral to the superior concha. The space above the superior concha is the Spheno - ethmoidal recess. 1. 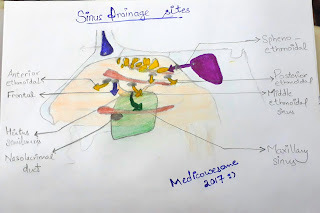 Frontal sinus - drains through a Funnel - like tunnel ( or infundibulum ) into the upper end of the Hiatus semilunaris ( a shallow depression in the lateral wall of middle meatus ). 3. 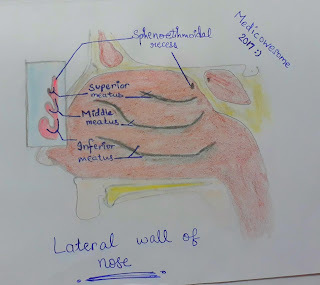 Sphenoidal air sinus - drains by one or two openings into the spheno - ethmoidal sinus. 4. The Maxillary sinus drains into the middle meatus to an opening in inferior part of the HS. 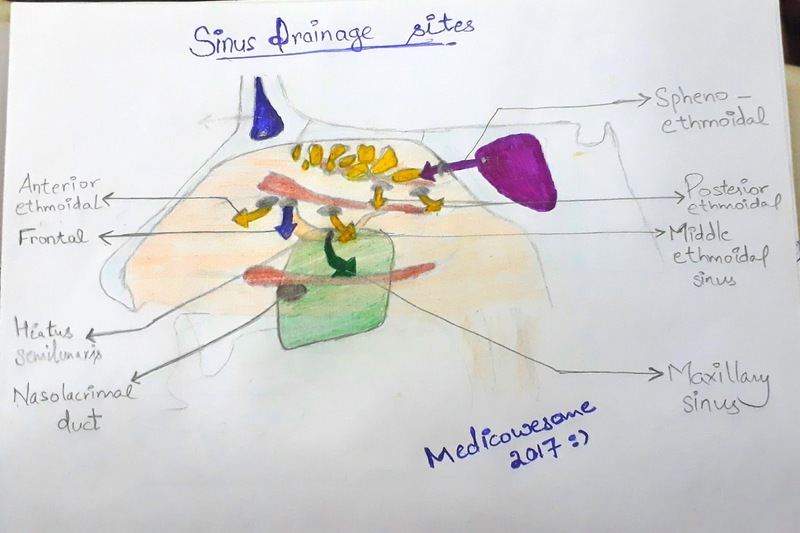 The drainage opening is usually located at the top of the sinus, so this sinus has to be filled completely before it can be drained. 5. Opening for the Nasolacrimal duct is situated in the inferior meatus ( guarded by Hasner's valve ) through which overflow of tears from the eye into the nasal cavity and its mixture with the mucus secretions in the nose takes place and is responsible for running nose when we laugh hard or cry. - The Ethmoid bone forms most of the part of the lateral wall, including the upper and middle conchae. 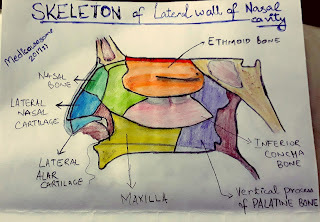 - The lower part of the lateral wall is formed by the vertical process of palatine bone and the body of Maxilla. 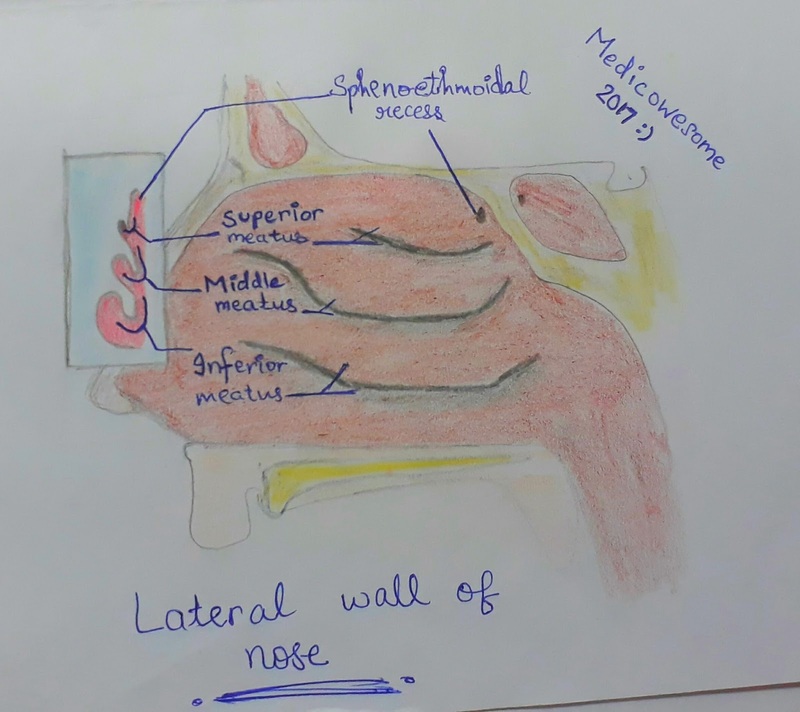 - Anteriorly, the lateral wall is formed by the Nasal bone, and the lateral nasal and alar cartilages in addition to various small unnamed cartilages. Thanks for such a wonderful notes. 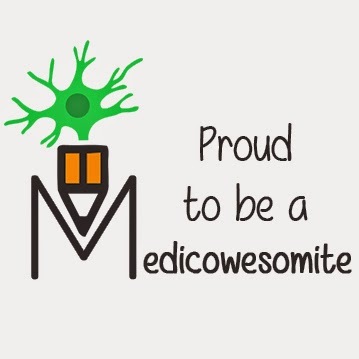 These basics are very useful for us which we easily tend to forget!